Top row, from left: Precious Waddy, Sylvia Mast, RJ Ocampo, Mario Hernandez, Cameron White. Bottom row: Nicole Litwiller, DeVantae Dews, Lindsey Krisak, Heyrin Cha, Luke Mullet. 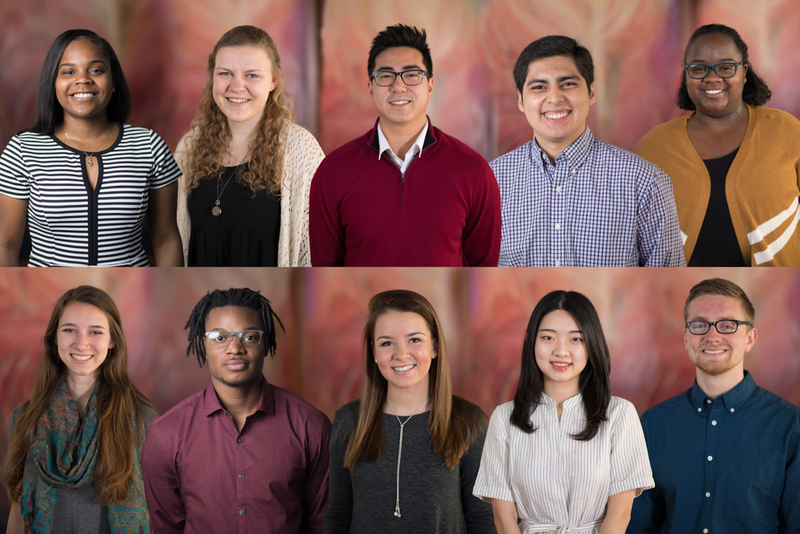 Ten graduating seniors will be honored as Cords of Distinction recipients in a ceremony Saturday afternoon, May 4, at Eastern Mennonite University (EMU). They will wear gold and blue cords during the graduation ceremony on Sunday, May 5. The cords are blue and gold. Blue represents strength of conviction that one person can help to create a better institution or community. Gold represents the love of spirit and yearning toward creating a better university environment or community. So so so proud of our boy RJ Ocampo. You always seem to stay on top of your game:) Keep soaring! I guess I’m talking both academic and volleyball:) Well done Son! Four great Academic Success Center tutors/employees in this group. Way to go!